Defining “dignity” – nailing jelly to the wall? 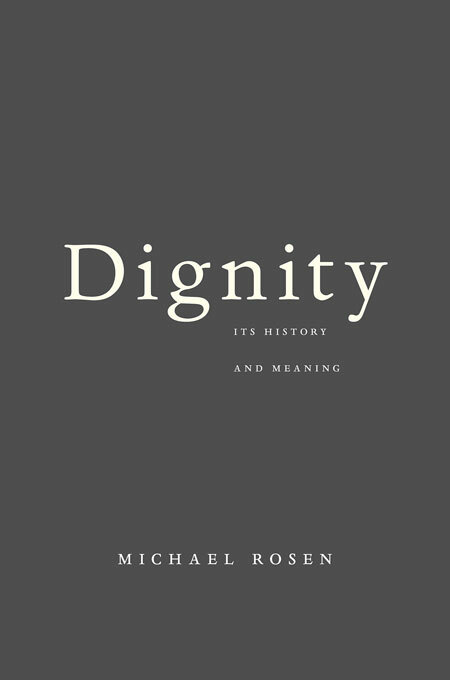 In his recent book Harvard philosopher Michael Rosen poses the question: what is dignity, exactly, and do we know it when we see it? We are all familiar with the mantra that all humans are endowed with equal dignity, but do we really understand what it means? Since it is a formulation that is increasingly advanced in justifying universal human rights, we should try to get to grips with it, rather than reversing into circularities such as defining it as an intrinsic quality from birth. What makes it intrinsic? And at what point is it acquired? And why do we owe the dead a duty of dignity when they have no rationality and make no choices, autonomous or otherwise? That expression, dignity of man, once uttered by Kant, afterward became the shibboleth of all the perplexed and empty-headed moralists who concealed behind that imposing expression their lack of any real basis in morals. So is this a catch-all provision that says everything and means nothing, a mere hollow piety that has somehow come to play a central role in the discourse of human rights, or, as Rosen puts it, ‘the closest that we have to an internationally accepted framework for the normative regulation of political life”? Rosen explores the early roots of the concept, from the works of Aristotle and Cicero to the modern notion of dignity which has inherited several distinct strands of meaning. So different in fact that contemporary users of the word often talk past one another: a prominent example is the Catholic church’s reliance on dignity of human life in its resistance to women’s reproductive rights. Iranian President Mahmoud Ahmadinejad describes his nuclear program as a “path to dignity” for the Iranian people. Like the terrorist/freedom fighter figure, dignity is Janus-faced. Morality is the condition under which alone a rational being can be an end in itself. . . . Hence morality, and humanity insofar as it is capable of morality, is that which alone has dignity. The problem with this notion is that it is based on the idea that all humans are alike, children of God and equal in His eyes. Without this religious foundation the idea of special dignity rests on shaky ground. It means only that we have something that animals don’t have. An “intrinsic” attribute or value from which animals are excluded may be metaphysically sound but doesn’t stack up biologicially, as we discover more similarities, both in terms of genetic make up and intelligence, with the non-human animals from which we have evolved. The Committee considers that the State party has demonstrated, in the present case, that the ban on dwarf tossing as practised by the author did not constitute an abusive measure but was necessary in order to protect public order, which brings into play considerations of human dignity that are compatible with the objectives of the Covenant.see . Rosen strongly disagrees with this view. Degrading the banned ritual may be, but it was voluntary humiliation and involved autonomy just as much as any other choice. Dignity has nothing to do with public order and everything to do maintaining the sanctity of the inner sphere. The notion that a person’s “physical and psychological integrity” is part of the private life protected by Article 8 ECHR, coupled with the right to dignity under Article 1 of the Charter of Fundamental rights, won the day in A & Others, R(on the application of) v East Sussex County Council where disabled individuals in a care home asserted their right to be lifted in an appropriate manner. The cases on asylum seekers referred to above rely on the right to dignity as a way of channelling social and economic rights through the grid of the ECHR and dignity is of course an oft-cited interest in litigation involving discrimination against homosexuals (see Ghaidan v Godin-Mendoza). Although these decisions are praiseworthy in themselves, the enforcement of an absolute, constitutionally protected right to dignity has created something of a legal quagmire, particularly in the German courts. Article 1 of the Grundgesetz led the Constitutional Court to order that the German military could not legally shoot down a passenger aircraft taken over by terrorists and headed towards creating terrible mayhem, on the grounds that doing so would be contrary to the dignity of the passengers (115 BVERFGE 118 (139)). The right to life of the people on the ground could not justify any infringement of human dignity of those in the targeted airplane, because this right’s guarantee neither allows nor admits to any justification based on other rights or values. Put differently, human dignity is always and unconditionally violated when infringed. Indeed the right to life of the potential victims played no part in the Court’s deliberations, being referred to only in terms of the right to state protection from being killed. The problem with the idea of human dignity is that it necessarily leads to such an absolutist approach, allowing no balancing act to be carried out when it inevitably runs into conflict with other human rights. The problem is differently illustrated in a series of censorship cases, also based on Article 1 of the Basic Law. We all remember the controversy courted by the clothing company Benetton in its depiction of dying Aids patients in its large poster ads. In Germany one of these advertisements, displaying a pair of buttocks bearing the stamp “HIV positive” was banned by the authorities. It was only by dint of contortionist legal reasoning that the Constitutional Court persuaded itself to quash the ban (102 BVERFGE 347). Freedom of speech was a “concretisation” (Konkretisierung) of human dignity, and therefore could not be suppressed in its name. The logic of this reasoning is far from clear and “Konkretisierung” is not a term of art, even in German adjudication. Since the right to dignity allows of no incursions by other human rights in the German constitutional order this approach makes no logical sense, and illustrates how perilously close the concept of human dignity can come to the sledgehammer of authoritarian censorship. The reason for this is that they are haters and they adore crafting a bunch of clever-sounding excuses to withhold dignity from other people – especially proletariat riff-raff. This is why we have had Tory rent-a-yes-judges deciding in the ballerina case that it is acceptable to leave old ladies lying in soiled incontinence pads overnight. That in the slopping out case, slopping out is OK. That in the Pound-land case, slavery is not slavery after all. But watch these bullies squirm when Mr Karma comes knocking on their door and writes out a prescription for a hefty dollop of their own disgusting medicine. They’ll soon re-discover their sense of indignity. Indeedd it a shame for the human race of our day and so called civilization in global scales ,because im hurt to experience from the world global village I mean international many are of those people who have no dignity putin innocent people in danger by prentend to be the heros and defenders of dignity simply because they can get rich and they love the game . Mr. Wackenheim made a choice that did not break the law. The assault on his dignity was to decide he did not have the competence to make it. As interesting as it is when laws attempt to regulate human life it always seems to me that human emotions and feelings are somewhat different and cannot be the subject of regulation; They exclude themselves. Dignity it seems is driven by feelings and so cannot be regulated directly. An elderly person in late stage alzheimer’s, on a good day, is in a playful wide ranging conversation, (wide ranging because of the disease) and expressing as much contentment/enjoyment as possible in those circumstances. The person they are in conversation with is asked by another person about a decision which under normal circumstances the elderly person would take; the questioner is referred to the elderly persons solicitor who is their legal guardian. The elderly person immediately expresses some hurt by this with their face and eyes also taking on a childs hurtful expression. Their dignity had been hurt, or as they put it their thumb (humanity) was hurt. A correct legal response provided in incorrect circumstances but one which was probably wrong anyway. Legal protections could not provide protection for the dignity of that person, and I would suggest none ever could without providing such environmental constraints that the people involved would completely loose their humanity. Too often jurisprudential and philosophical thinking fail to include those issues as they strive to produce a singular logical answer, even so I look forward to reading the book. I think there are two main points which arise out of this posting. Firstly, on the specific references to German legal decisions on dignity, we have to be aware of their history. They are still coming to terms with what happened to their country and society during the Nazi era, so it is unsurprising that they are possibly more concerned over the concept of dignity than many other countries. Secondly, dignity is what I believe philosophers describe as an essentially contestable concept, i.e. it can mean different things to different people. It strikes me that many of the concepts such as dignity, liberty, freedom, etc. were originally formulated by Ancient philosphers, then clarified further by religious thinkers. These definitions are of limited use today as our societies have grown increasingly more diverse. This is why we have ended up with popular legislatures and courts of law to ensure that modern day societies have modern day versions of these ancient concepts with which they can work. Whenever I get into a discussion about morals, I always state that I understand these to be based upon the word mores, which – in essence – means that concepts like dignity become what society overall thinks they are. This understanding can be informed by a process involving the popular media and elite ethical standards, which permeate through to gain popular support. At the end of the day, concepts such as dignity rely upon common definition, even though popular expression may be muted and uncertain for some time. Eventually, the popular understanding of different concepts become clear such that legislators and judges can make expression to the popular moral and elite ethical standards which then become adopted in changes in the law, through parliaments and/or courts of law.